Before I cover the development updates, I wanted to share this new collage I put together containing various games, demos, and example maps that have been created with RPG in a Box. 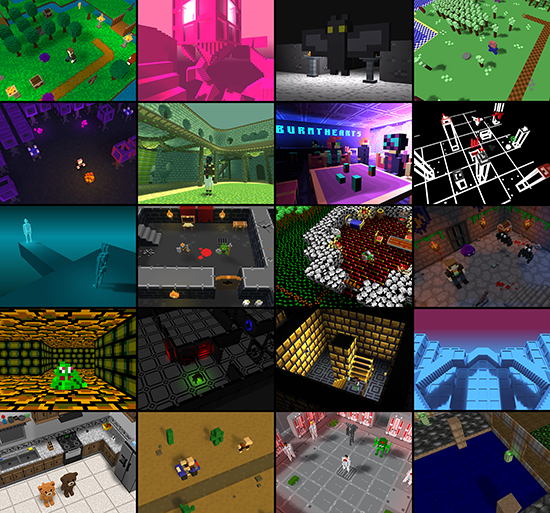 It’s exciting to see the diversity of what can be made and I look forward to seeing what else the community creates! Although I took a bit of a break from the Map Editor to focus on other areas, I was able to finish up some improvements to the navigation system, specifically a simpler method for adding, modifying, and removing paths. This should make the process of tweaking your map’s navigation and interaction paths much less tedious! Regarding the other areas, the Item Editor has now been completely implemented for v0.5! There won’t be any new major functionality relating to items in v0.5, but the interface has been cleaned up some and I added a search box to search names and descriptions by keyword, a button to duplicate an item, a button to reload the item database from disk, and a large image preview in the overview section. 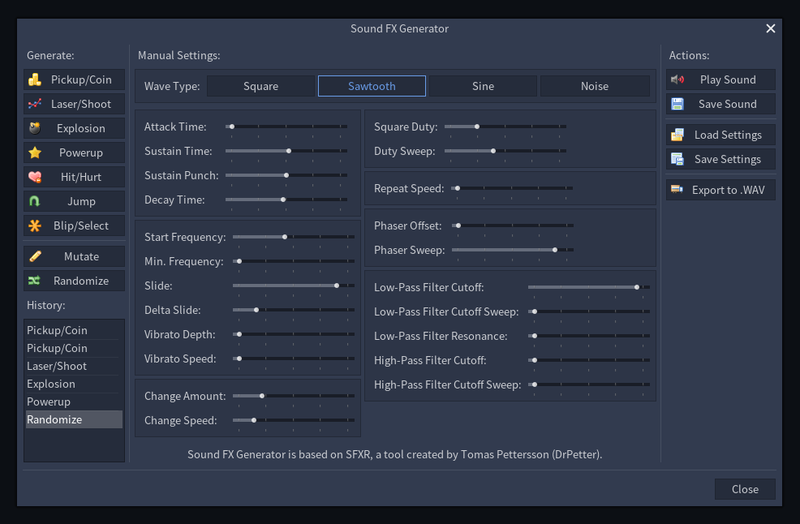 The Sound FX Generator is also ready to go for v0.5! I decided to go ahead and knock this out since it’s mostly a standalone feature and straightforward to put in. It’s nice seeing everything like this using Godot’s awesome new UI theme. Lastly, I’ve been working on getting the new Theme Editor ported over. I still have a bit to finish up with this editor, but I’m excited to say that the new version will support multiple themes! Also, within each theme you can have multiple dialogue styles. This will eventually allow you to specify different dialogue styles for each character or even change the overall interface as your game progresses. On different note, I took a bit of time and added a small new feature to the current version that could potentially allow for some interesting new gameplay options! You can now specify animations for each cardinal direction (for example, “walk_north”, “walk_east”, etc.) that will be triggered if available. If provided, the game won’t rotate the character model to face the direction they are moving as it usually does. 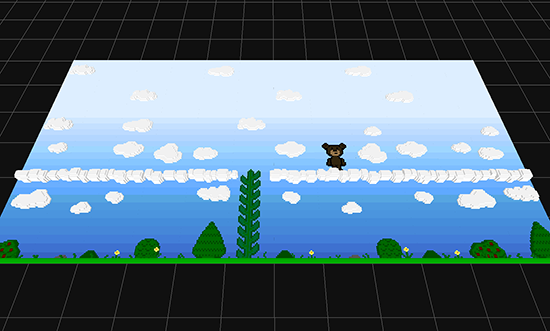 By combining this with the top-down camera and “sideways” tiles, you can somewhat create a 2.5D side-scrolling map. See below for this new functionality in action! The assets were created by my wife for a game she’s currently making in RPG in a Box. This feature is still experimental at this point, but with some additional time and effort it may potentially turn into something cool. If you haven’t already, I’d recommend checking out the Trello board for RPG in a Box to follow my progress in real-time! 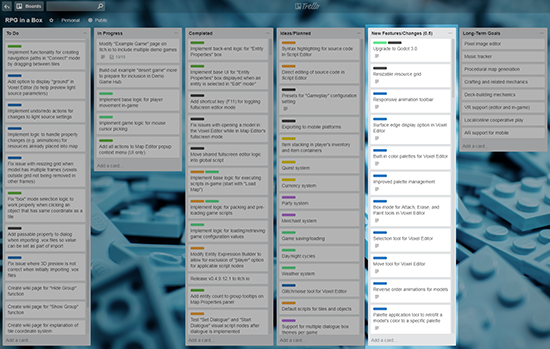 I recently updated the board with a bunch of cards (in the “New Features/Changes (0.5)” list) with information on new features and changes that are completed and will be included in v0.5. Many of them even have GIFs or screenshots if you open up the card! If you’d like to find out more about RPG in a Box or try out the free demo version, check out my Itch.io page here. You can also wishlist and/or follow RPG in a Box on Steam by visiting its Steam store page here.